Here are the answers to the most frequently asked questions about renting a motorhome in Canada. There are no special licenses needed. You can use your own driver's license from your country of origin, as long as it is full (not probationary) and valid (not expired). If your license is not in English format, you will need to bring an official translation or obtain an international driver's license . Generally, all drivers must be at least 21 years old. However, some operators do require for drivers to be at least 25 years old. Is there a fee for extra drivers? Extra drivers are allowed, and although some operators do not charge for an additional driver, some do charge a small fee. All drivers must be present at the time of pick up to sign the Rental Contract. Can I pick up at the airport? The RVs can only be picked up and returned at the designated depots. However, some operators do offer transfers from the airport or airport area hotels. Although some transfers are complimentary, some operators do charge a small fee. What time should I pick up and drop off the RV? Although most depots are open between 9AM to 4PM, collections are usually allowed starting 1PM while returns must be done by 10AM. Only a few operators allow morning collections. Are one way hires possible? One way rentals are possible, but please check if the supplier has a depot in the chosen return location. One way fees may also apply and always depend on availability. How many people can travel in the RV? This depends on the number of seat belts and the sleeping configurations in the vehicle. All passengers must have a seat belt on whilst the RV is in motion. Some vehicles have exterior storage compartments. Due to limited storage room (which is generally under the seats of the vehicle), soft or collapsible luggage is recommended. Can I leave my luggage at the depot? Some operators allow storage at their depots. Some operators do allow parking at their depots, but clients are advised that they are leaving their car at their own risk. 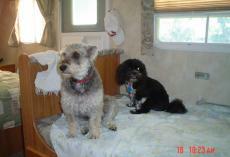 "Maxwell and Bailey in RV"
Only a few operators allow animals in their vehicles. A cleaning fee and pet fee may apply. Is smoking allowed in the RV? Smoking in the RV is strictly prohibited. Can the RV be fitted with child seats? All RVs can be fitted with baby and booster seats, although only a few operators offer child seats for hire. Is there are a minimum rental period? For round trip rentals, the minimum rental period is 3 days. For one way rentals, the minimum rental period is 7 days. The minimum rental period can be extended to 10 to 14 days during peak season. All travelers are recommended to take out their own personal Travel Insurance. Although the vehicles are already insured, it is best to purchase the Full Insurance Cover to reduce the excess. Read more in Insurance Jargon In Simple English. Can I hire bikes with the RV? Some operators offer bicycles and bike racks for hire. What is the difference between Class A, Class B and Class C motorhomes? Class A RV have flat fronts like buses and are the largest type of motorhomes, usually with complete entertainment features like TV/DVD, etc . Class B vehicles are the smallest, and are sometimes called “conversion vans”. The Class C RV are identified for the “hump” which holds a bed over the driver's cabin. Can we bring the RV to the US? Travel to the US is allowed, and some operators charge a fee for US travel. What is the Northern Surcharge? This fee is applicable for travels to Alaska, Yukon and the Northwest Territories. Clients must advise at reservation time if they wish to travel to these locations. Is there roadside assistance included in the price? All operators include roadside assistance in their packages. A toll free number will be provided at collection time. Can we travel during Winter? Only a limited number of vehicles are considered “winter vehicles” and would be available for rental between November to April. Also, some depots and caravan parks are closed during these dates so travel during Winter must be done with caution. Although the deposit or reservation fee can be taken from a debit card, a credit card is required for the security deposit or bond to be charged at pick up. The included deposit, or reservation fee, is non-refundable. In case of a booking amendment wherein the new deposit is less than the original deposit paid, the difference is not refundable. How much fuel does the RV consume? A standard RV can consume approximately 10-15 miles per gallon, although this may vary depending on road conditions, temperature and driving style. If you decide to cancel your booking, the included deposit is non-refundable. Depending on the operator, certain cancellation charges will apply. Did you have a question that's not listed here? Send us an email to info@mydriveholiday.com. Your question could also be included in our list soon. 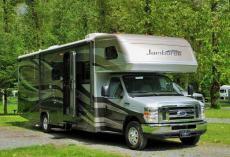 Start looking for the perfect motorhome for your self-drive holiday in Canada RV Rental.